Weedon Road Industrial Estate, Northampton. NN5 5AJ. Fast Computers now offer Remote Support, allowing us to assist you with your computer problems from the comfort of your home or office. From just £20 per 20 minute session, we will 'dial in' to your system, diagnose the problem and attempt a fix there and then. 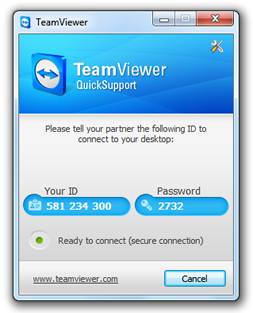 Download our free software which allows us to contact your PC. 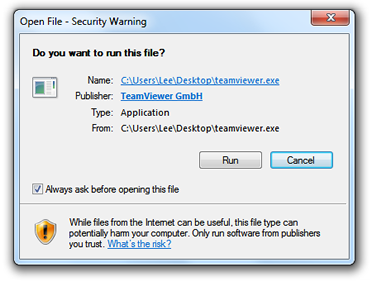 Click the icon below to begin the download, and select 'Save to File'. Finally, you will be presented with the following page - from here, you can now call us on (01604) 58 2000, let us know 'Your ID' and 'Password' and we'll do the rest! © Fast Computer & Laptop Repairs Ltd. 2013.